White". Geo & Rose out also, enjoyed it much Friday November 14 Another dark cloudy day, tho' looking little more like clearing up sometime, spent the day at odd jobs as usual, in to see baby of course, learn Maz Stewart had chills & fever, but is better this eve. 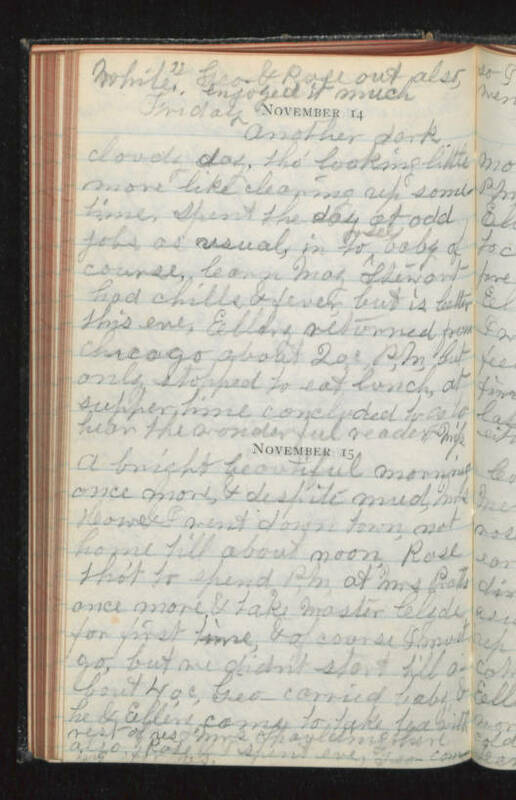 Ellery returned from Chicago about 2 o,c, P.M., but only stopped to eat lunch, at supper time concluded to go to hear the wonderful reader "Miss November 15 A bright beautiful morning once more, & despite mud, Mrs Howe & I went down town, not home till about noon. Rose tho't to spend P.M. at Mrs Pratts once more, & take Master Clyde for first time, & of course I must go, but we didn't start till about 4 o,c, Geo- carried baby & he & Ellery came to take tea with rest of us & Mrs Spaulding there also & Rose & I spent eve, Geo coming for us.